According to the Wikipedia page for the Oxford Comma, "Use of the comma is consistent with conventional practice" and "Use of the comma is inconsistent with conventional practice." Did the Oxford Comma come before its omission, or was the Oxford Comma traditionally omitted? It makes logical sense that every item in a list would be separated in the same way: by a comma. 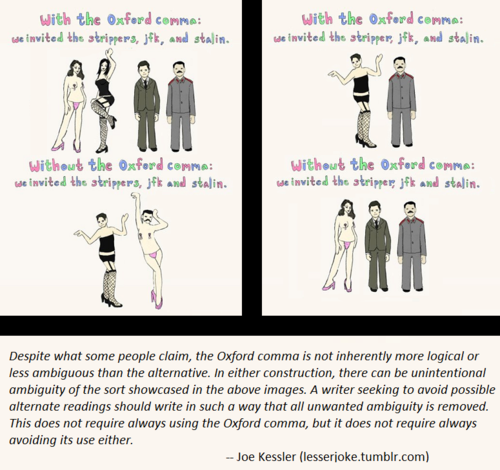 If the Oxford Comma is conventionally correct, when and why did people begin to omit it? There are situations where use of the Oxford comma will make or break a sentence. Choose a style and be consistent. When you run into a situation in which your choice suggests a misinterpretation of the sentence, rewrite it in another manner to avoid the confusion. We invited the strippers, JFK, and Stalin. = Strippers and JFK and Stalin. We invited the stripper, JFK, and Stalin. = JFK (the stripper) and Stalin. We invited the strippers, JFK and Stalin. = Strippers named JFK and Stalin. We invited the stripper, JFK and Stalin. = Stripper and JFK and Stalin. If find the Oxford comma to give fair representation to how people speak. When listing items in speech, equal pause is given between each item. For me, the Oxford comma emphasizes that there is, indeed, a pause before the 'and' preceding the last item of the list. I think the Oxford comma also indicates the direction of the sentence -- it makes it clear that you are reading from a list. Often I find myself rereading sentences that don't make use of the Oxford comma because, on the first pass, I have misunderstood what they are saying. But, as your question points out, many do not use the Oxford comma (e.g., The New York Times). I don't have information about the history of this, so I'm just responding to the second part of your question. Why should there be no comma before 'and'? The answer is simple - there has never been a convention for adding a comma (as far as I know) for mentioning two items: I like apples and oranges or She doesn't mind running or swimming. The problem comes when you want to add a third item: I like pears, apples and oranges or She doesn't mind jogging, running or swimming. It must seem fussy to people to insist on a comma before 'and' here, if there was no comma for two items. Not the answer you're looking for? Browse other questions tagged punctuation commas writing-style or ask your own question. Sentence with multiple 'and's: should I use an Oxford comma, and if so, where? Comma after the noun of the Oxford comma?